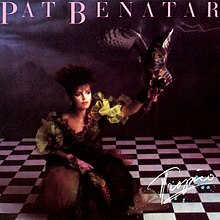 Some of the same accusations I hurled at Starship on their “Knee Deep in the Hoopla” album were also hurled at Pat Benatar when her “Tropico” album came out. Those accusations were that she had abandoned her hard rock roots and sold out and became a top 40 artist. Like I said last post, the label ‘sold out’ was banded about quite a lot back in 1985 against many artists both fairly and unfairly. The question here is: Did it apply to Pat Benatar? First of all, while this album is certainly much softer than its predecessors, it is in no way 80s top 40 synth pop. If anything, Pat goes more progressive rock here with the keyboards tastefully done. Full marks should be given to Charlie Giordano here, he does a masterful job on the keys throughout the album. While there are no real power chords on the album, Neil Giraldo still works his guitar magic on the album. Most of the guitars sound acoustic and the even the electric guitars are toned down but Neil still lets you know he hasn’t gone away. My only lamentation was that there isn’t any of his great guitar solos on it and that in my opinion, causes the album to suffer a little. However, what is omnipresent throughout is the unmistakable voice of Pat. Yes, “Tropic” may not be as musically fierce as her other offerings but her voice still shines on each and every track. Then again, she could sing any form of music and make it sound great. As for the songs, I didn’t want to admit it back then but I have always kind of liked the first single, “We Belong.” It’s is anthem type song that although not a rocker, is still cool. However, I still can’t take to the second single, “Ooh Ooh Song.” Then there’s the hidden gem on the album. That honour goes to “The Outlaw Blues.” That song is the closest Pat comes to her previous material but it’s not a rocker. Just a good song. “Love in the Ice Age” and “Suburban King” are good songs too. A long time ago, I took back all the things I said about Pat Benatar selling out on the the “Tropico” album. Yes, it’s different and I still prefer her earlier hard rock albums but this one is still good.